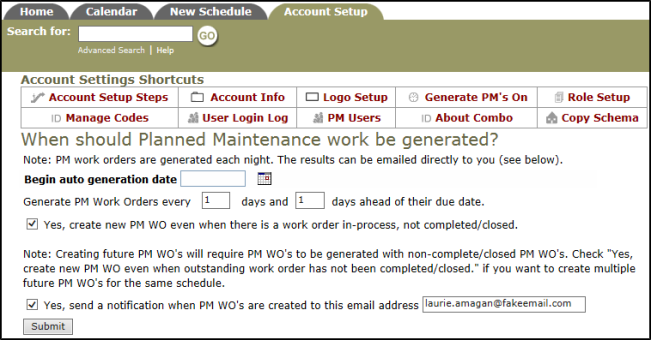 The Generate PM's On setting activates your account to begin creating PM work orders. It is also where you will set how often the Dude Solutions servers will generate those work orders for you. Planned Maintenance will automatically generate PM work orders based on the schedules that you enter into the system. These work orders are generated at midnight each night into your Work Order account. Click the Generate PM's On link in the Account Settings Shortcuts at the top of the page. Select the Begin auto generation date. This is the date that the Dude Solutions servers will begin to check your active PM schedules for work orders that need to be generated. Once you set this date, it cannot be changed. Decide how often you want PM work orders to be generated by filling in the following blanks: Generate PM Work Orders every __ days and __ days ahead of their due date. This tells the system how often to check the schedules for work that needs to be generated as well as how much lead time you want before the scheduled due date. We recommend setting this to Generate PM Work Orders every 1 days and 0 days ahead of their due date. This means that the system will check every day for work orders that need to be generated and that they will be created on the date you specify in the Frequency step of the schedule. Decide whether or not you’d like for a new PM work order to be created, even if there is a work order still in-process and not completed/closed from the same schedule. Indicate your decision by using the check box provided. If left unchecked, the schedule will not create a new work order until the previously generated work order has been marked complete or closed. *Note: We recommend checking this box to ensure that you do not miss future work orders due to potential clerical errors. Check the last box if you want an email to be sent when the system creates a batch of PM Work Orders. Enter the recipient's email address in the field. *Note: This is helpful if you are printing out the PM work orders for your technicians. One person will be notified that a batch was created and can then log into the system to print them out. Click Submit to save your selections.